The MWC – What, when, where? The Mobile World Congress (MWC) will take place from Monday 25th to Thursday 28th February in the events center La Fira in the vibrant Catalonia capital: Barcelona, Spain. It is one of the biggest yearly events in Barcelona with over 107,000 attendees in 2018 and even more expected this year. The international tech community will come together for the world’s largest annual trade show run by the GSMA, exhibiting the latest trends in the mobile industry. This year we expect to hear about the future of mobile, 5G, mobile hardware, smartwatches, new ranges of tablets, VR and other associated technologies. You can pick up your MWC badge and transit pass at the airport. Overall transportation, the airport, and hotels are running smoothly, unlike in previous years,there haven’t been threats of transportation or workers’ strikes during the MWC. 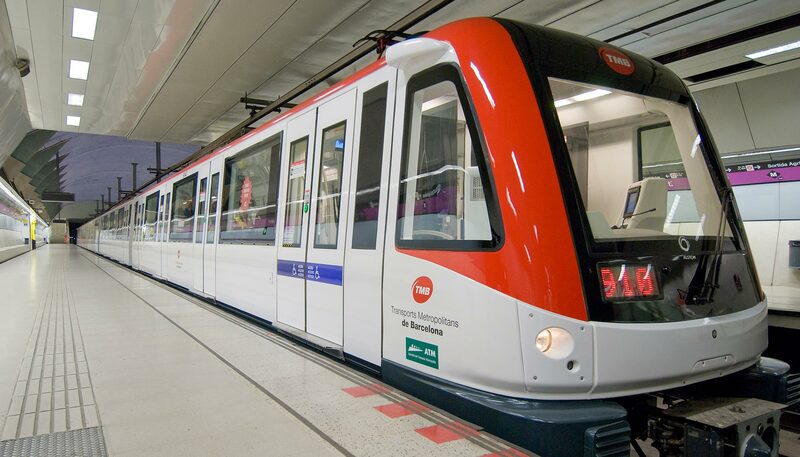 The metro line 9 runs from the airport, also there is an overground train which runs to Sants Estacio and Passeig de Gracia station, there is also an airport bus which takes you to the main stations in the centre of town. The train stations are a long way from the North Entrance and Hall 8. If that’s where you’re going, your best bet is still to take a taxi, or the frequent H16 public bus from Placa Espanya or Placa Catalunya to the corner of Passeig de Zona Franca and Foneria, which is close to the North Entrance. MWC will also run a shuttle between the North Entrance and Hall M8 at the older convention center by Placa Espanya. You can still book a taxi with the app MyTaxi. But bear in mind Uber or Cabify are still available, but the latest news on Spanish legislations means they must follows new rules requiring vehicles to be booked with at least 15 minutes’ notice. Overall, taxis are relatively affordable, especially if you’re on an expense account. Tip by rounding up to the next euro. A taxi from Placa Catalunya, in the center of town, to the Fira Gran Via should cost 15-20 euros. MWC also runs special shuttle buses from hotels in outlying areas to the event. A good tool to keep in mind is the flexible hotel booking app BYHOURS. The innovative Barcelona based-startup BYHOURS engineered the first international pay-per-use system for hotels, calling their product: ¨microstays¨. BYHOURS enables you to book hour packs of 3, 6 or 12 hours, making it perfect for using a hotel for a few hours for a place to nap, rest and recharge when you arrive in Barcelona and can’t check into a hotel yet. However, there might be less options of hotels in Barcelona during the busy MWC days, but it’s a handy tool to keep in mind to use in Barcelona or around the world when travelling back home. Antoni Gaudí´s avant-garde surrealist masterpiece. The building of the Sagrada Família began in 1882 and although still not finished the church is a UNESCO World Heritage Site. A must see in Barcelona, you can enter the church for €17. 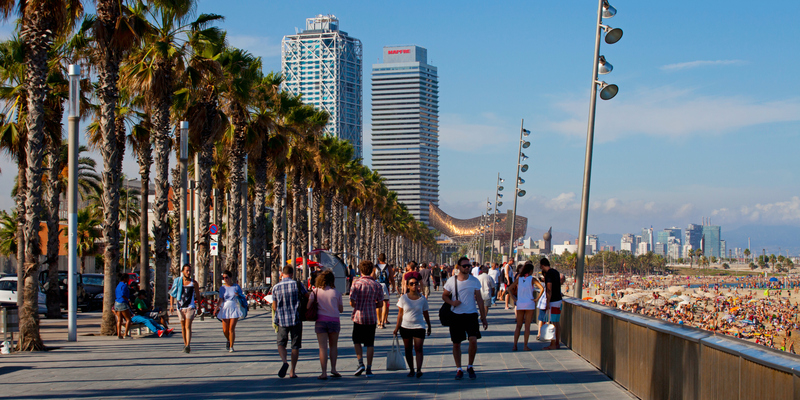 Take a walk in the neighborhood of La Barceloneta borders the long, wide Sant Sebastià Beach, where locals go to sunbathe, surf, and socialize in the many seafood restaurants and tapas venues that overlook the sea. A long promenade lined with palm trees connects the beach area to marinas filled with yachts. The Barri Gòtic, with an almost magical old-world ambience, and Modernist architecture is a perfect place for a wander down the narrow cobblestone streets and atmospheric alleyways. With endless cafes, restaurants, bars and boutiques. There is also the Picasso Museum and the Plaça del Rei, a delightful lovely palm-fringed square just off the ramblas with restaurants and bars. Stroll down the long main shopping street of Barcelona and see Casa Batlló – one of the most characteristic Modernist Gaudi buildings in Barcelona. Take a walk down the most famous street of Barcelona to see the Mercat de la Boqueria (food market), expect busy hustle and bustle, with street sellers, live music, a mime show, or other impromptu street performances. This scenic area of the city is known for its beautiful natural park with great views and superb museums. The National Art Museum of Catalonia has an exceptional collection of Catalan art from the 10th to the 20th centuries, the Magic Fountain is a must see too. Park Güell is beautifully landscaped and features architectural elements in Gaudí’s signature style. Viaducts, grottoes, a colonnaded hall, winding staircases, and semi-closed conversation seats are scattered throughout the space. These creative structures are decorated in multicolored ceramic fragments. A spectacular terrace offers panoramic views of the city and the sea. Gaudí himself loved this area of the city, and his home was located here. Home of the FC Barcelona, the 99,354-seat stadium is the largest in Europe and second largest in the world. If you are a big fan you can do a tour of the stadium for €26. However, there is ´classico´- semi-finals of the Copa del Rey between Barca vs Real Madrid – football match on Wednesday 27th February which takes place in Madrid, we advise to try and watch it in a local bar to experience the real Spanish football passion. If you want to experience real Catalunya cuisine try the seasonal food: calçots. Experience an authentic calçotada, a barbeque party where the main ingredients are the calçots, basically a variety of scallion– a spring onion that is ready for picking sometime in January and has usually disappeared by the end of February/early March– maybe April. Dip them in the calçots sauce (a combination of almonds, hazelnuts, stale bread, garlic, ñora peppers, ripe tomatoes, olive oil, and sherry vinegar). Wine is not with the tradition porró (porrón in Spanish) traveling around the table, enjoy the Catalan way! Restaurants of all backgrounds are more than abundant throughout Barcelona, and especially in the center. For mid week lunch most restaurants serve a ¨Lunch of the day¨at a very reasonable price which typically includes 3 courses and a drink for around 12 . 15 euros. If you want tapas specifically in the centre the notorious El Nacional restaurant right by plaza Catalunya on Passeig de Gracia without a doubt will impress. Divided into different sections you can try traditional recipes from around the Iberian Peninsula, prepared with high quality produce in a unique surrounding. Located at the heart of Barcelona, on Passeig de Gràcia, it reflects Barcelona, not just with the food but also the space itself, the decor combining modern and traditional styles, being a former parking lot it’s a genius interior decoration project. Drinks and where to party? All over the center, for example the streets off the ramblas in Gothic and Plaza real, are full of bars and smaller clubs. BYHOURS—There’s always a place to crash on an exhausted day in Barcelona with this app, which lets you grab three-hour blocks at local hotels. Google Translate—Google’s translation app handles both Catalan and Spanish like a charm. Bon dia (bon–dee-ah) / Hello –A simple ‘good day’ will get you a long way when it comes to getting off on the right foot with the locals. De res (da-ress) / You’re welcome –Saying your ‘pleases’ and ‘thank you’s’ is just as important in Barcelona as it is anywhere else. Show off your good manners when someone thanks you for something with a courteous des res. Adéu (ah-deh-ou) / Goodbye – It doesn’t matter whether people are speaking Spanish (Castellano) or Catalan, when it comes to saying goodbye everybody in Barcelona uses adéu. Over three days, 4YFN will showcase the latest tech startup innovations from around the world. Featuring curated content, startup pitches, competitions and dedicated networking sessions. The event is tailor-made to connect the international startup community, investors, talent and corporations. A free shuttle bus will transport you to and from the venues from Fira Montjuïc to Fira Gran Via. In this open mic session any attendee is given 30 seconds to ask for help for their startup. It will be an excellent opportunity to learn from the best VCs in town (TBA) in a panel, hosted by Chapter Director Àlex Rodríguez Bacardit. The networking session will allow attendees to talk to each other freely over some beers and delicious empanadas, a great way to make new friends and exciting connections. For more information on the Mobile World Congress.